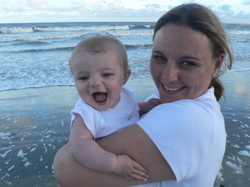 As you can see, we had a great time in South Carolina! 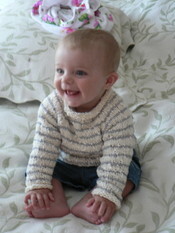 -totally-knit-that-it's-a-pea-pod-baby-set. And lookey, lookey, guess who designed it. Yep, Kate. And I am not just saying this because she's a friend. She is just a designing genius. So, I ran to the LYS, and agonized between a white cotton and pink Rowan Wool Cotton (I like the cotton, and it's cheaper, but this wool cotton is so soft, but it's pink, and what if we have another baby, and that baby is a boy and...blah blah blah internal monologue here). 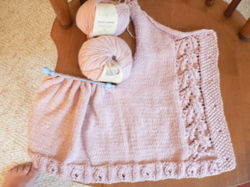 But I picked the pink - going with my knitter gut instinct. And I cast on in the car ride to SC, got a sleeve done. And here's where I am with the body of the cardigan. Have I ever mentioned that I love any knit item that removes the tedious act of seaming? I am knitting this on US6's, and I like the yarn. It's very soft, but not necessarily a yarn I would use for an adult project, for which I prefer more stiffness - this one, like Debbie Bliss Cotton Angora, is perfect for rugrats but not great for adult sweaters. I also used this weekend to finish up a sweater I started working on back in March - knit using ArtFibers' Brioche yarn on size 10's, with 4 st/in. 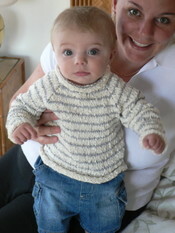 I used Ann Budd's Sweater Book as a loose guide, but mostly made the pattern up myself. * It's a raglan sweater with roll-neck (and roll-sleeves and bottom hem). I think it turned out really great! *Uh, it wouldn't have been such a "loose" guide if I hadn't realized I was following instructions for the wrong gauge halfway through the project - oops! Note to self: photocopy patterns and underline size you are working on. Does every knitter get this? The overwhelming feeling that it's time to ... O-R-G-A-N-I-Z-E and C-A-T-E-G-O-R-I-Z-E ? ? ? *In fact, I have been known to actually turn out the light, and turn it back on because the urge was so strong! 1.) Clapotis II - Another fantastic knitting experience, grace a Kate Gilbert. I just love this pattern, and I repeated it exactly, with the exact same yarn (Lion and Lamb), but in a different colorway. I wear my Clapotis a lot, so I "needed" another one to match more outfits. I'm on the decreases (home stretch, bay-bee! ), and just like my last Clap, I will be required to delve into a fourth ball - but I guess that's pretty common (Kate, how the heck did you do it with 3? I'm not even close.). 2.) Debbie Bliss Tennis Sweater - Remember, I started this one, then got preggers. But I was sure I would finish it before the end of the pregnancy. Ha. But, I am only a HALF SLEEVE, a collar, and some finishing touches away. No excuses pretty girl, this one must get done. Plus, I have never made a sweater for myself. Me me me! 3.) Raglan Sweater - This sweater is the product of a serious KNITTING EMERGENCY. I got on a plane for a 10 day trip to CA, where there would be gobs of baby-holders, and then I realized...okay, don't faint...that I had forgotten to pack my knitting! (Sure enough, when I got home, there it was, all packed up and sitting - next to my bed.) So, it gets worse. After a cross-country flight with NO knitting, we rent a car to drive 3 hours north of San Francisco, with NO knitting. But we make a pit stop. And there's a knitting store. So weird. Hubby insists I go in. I oblige. I don't have a photo of the finished product, because it is in the car, trying to get itself some buttons. I scoured THE ENTIRE button collection at JoAnn Fabrics (like, 2 gazillion buttons), and did not find a single one that I liked. What the...?? 4.) Artfibers Sweater - And well, you know, we were in San Francisco, so I just thought I might pop into Artfibers. Not to buy anything, just to look. Yeah right. So, I picked out this great yarn (Brioche, 4 st/in) in white and mauve, to make a striped raglan (bottom up). I'm doing it on size 10's, so it should be a quickie. Should be - but then again, I always say that! These are little baby booties from a Phildar magazine, done in Koigu on size 2 needles. Aren't they so cute? And look at those cute chubby little legs!